Dental implants are the best treatment known to replace a lost tooth. It is ideal for people who maintain good oral health and have lost teeth due to injury or gum disease. 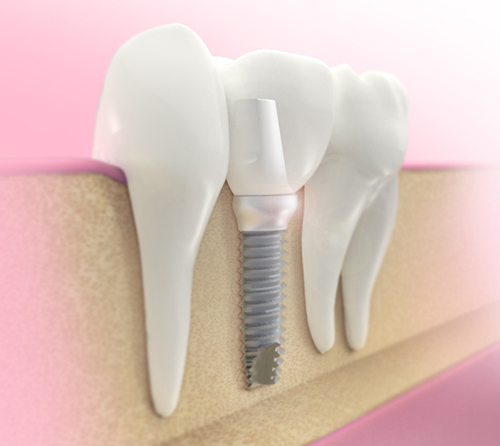 Implants are screw-like materials that replace the root portion of natural tooth. They are placed inside your jawbone by surgery over which crowns, dentures or bridges are fixed. If placed under proper conditions and further maintained diligently, implants can last for a lifetime. Endosteal implant : This is a commonly used implant and is in the form of screws, cylinders or blades, which are surgically placed inside the jawbone. Sub-periosteal implant : These are placed over the surface of the jawbone and are used if there is very little bone height left behind. An ideal candidate for a dental implant is one who is in good general and oral health. You should have a good amount of bone height in order to place the implant and also healthy gum tissue. Stage 1 : In this stage of treatment, the titanium implants are placed inside the jawbone by surgery. This will remain covered inside the gums for about 3-6 months for osseointegration to take place. Stage 2 : This stage involves uncovering the implants and attaching bases for the artificial tooth to be fixed. Stage 3 : The new teeth are fixed onto the base. Aesthetic factor : A dental implant will look almost like your old natural tooth. Conservative : It does not need any changes in the adjacent teeth. Dental implants are close to your natural teeth and require the same home-care and regular dental visits. Brushing and flossing at least twice a day is recommended to keep the dental implant clean and free from dental plaque. Periodic follow-up visits are scheduled after your treatment to ensure the dental implant and gums are in a healthy condition.